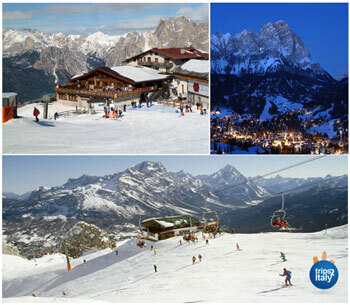 Ski & Snowboarding Trips In Italy - The Ski Adventure Of A Lifetime! While skiing may not initially come to mind when planning an Italian vacation, the many ski areas of Northern Italy – ranging from small and charming to large and elegant – have enticed skiers for decades. With resorts dotting the Italian Alps and Dolomite mountains, Italy offers skiers and snowboarders a variety of benefits that make it a choice destination for Winter sporting vacations. Between the pristine slopes, panoramic views, hospitable locals, and unparalleled Italian wine and cuisine, a skiing or snowboarding trip to Italy redefines what it means to vacation in Italy. The smallest region in Italy, the Aosta Valley is home to some of the most incredible mountains in the world – including Mt. Blanc, the highest mountain in Europe. One can ski this towering mountain at the world-renowned ski resort Courmayeur. Know to be a hot spot for VIPs and celebrities, Courmayeur boasts more than 100 miles of slopes. The cradle of mountaineering, this alpine town invites travelers to experience the history and wonder of its variety of first-class snow activities. Another gem is the massive ski district of Breuil Cervinia. As one of the largest in Europe – spanning three valleys and two countries and featuring over 150 miles of slopes – the resort offers a wonderful variety of activities, including cross-country skiing, snow kite, eliski, and free riding. If looking to ski high-altitude slopes, take a trip to one of the best-kept secrets of Italy – Monterosa Ski. Located in the center of the Italian Alps, this resort offers beginner to expert slopes in altitudes between 1500 and 3200 meters. For families and adventurers alike, La Thuile – a mining town turned modern ski resort – is a great option. Parents will appreciate the childcare offered while cross-country skiers will delight in the wide variety of courses available on its 90 miles of slopes which span both the French and Italian side of Mt. San Bernardo. Visitors can easily move from slope to slope on La Thuile’s technologically advanced lift system. The Dolomites of Veneto are as enchantingly beautiful as they are imposing. The high peaks and fresh snow offer splendid opportunities for snow sports, so it comes as no surprise that the most famous and prestigious ski resort in Italy is located there. Cortina d'Ampezzo – home to the 1956 Winter Olympics and set to host the 2021 Alpine Ski World Championships – is a resort encircled by the Dolomite Mountains. Part of the Dolomiti Superski circuit, it offers over 155 miles of slopes ranging from difficult courses like la Forcella Rossa or il Canale Staunies to beginner friendly slopes like la Tofanina. Known as the “Queen of the Dolomites”, Cortina melds thousands of years of Alpine history with first-class snow sports to create an unbelievable experience. The region of Trentino Alto Adige boasts a landscape that looks straight out of a storybook. With a backdrop comprised of Europe’s best mountains – the snow-capped Dolomites – and a long winter season, a variety of some of the world’s most internationally known ski resorts call this area home. 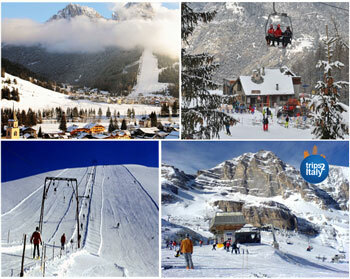 A wonderful skiing area in the region is Alta Badia. Located in Val Badia, it offers 75 miles of slopes, including 4 black slopes – among which is the famous Gran Risa slope, a site that’s featured many World Cup competitions. Another great area is is Val Gardena. Among the largest ski areas in the country, it features over 100 miles of slopes amidst towns like Ortisei, Selva di Valgardena, and Santa Cristina. Though an area more geared toward experienced skiers, it also offers areas for cross-country skiing and freeriding. Often hosting VIPs from celebrities to royalty, this resort has become a defining destination for winter holidays and a premiere ski and snowboard site in the region. While nearly all the region’s resorts offer snowboarders great options, there are a few standout areas. Located in Val Gardena, Alpe di Siusi features a snowpark so great it was nominated as one of the top 3 "World's Best Freestyle Resort 2017" at the annual World Ski Awards. It is one of the longest terrain parks in Europe, features 70 obstacles over 1.5 kilometers, and is the training location for the Italian national snowboarding team. For those looking for a casual and fun experience, check out Piz Sella in Val Gardena. Known as the “fun park” because of its variety of children and beginner focused activities, it is a great choice for families looking to experience a snowpark. Located near Brunico, the Plan De Corones snowpark features a little bit of everything for snowboarders, from child-age to seasoned freestylers. It includes lines for all skill levels – obstacles for experts, kids-only sections for children, a family-fun area, and an area for beginners looking to be exposed to freestyle snowboarding. Sharing a border with Switzerland and occupying a large section of the Alps, Lombardy features 110 mountain peaks at a high elevation, making it a paradise for ski bunnies. A charming and historic ski destination, Livigno is known for its incredible mountain beauty and strong winters. Competitive skiers have trained here for years, as the variety of slopes available make it a great locale for everything from cross-country skiing to biathlon training. Amateurs can enjoy the slopes as well, while non-skiers can simply admire the landscape views or go shopping in the area’s many boutiques and shops. Located in the National Park of Stelvio, Bormio is another popular ski resort in Lombardy, which features 30 miles of slopes. In 1985 and 2005 it was the location of the BIS Alpine World Ski Championships and often attracts cross-country skiers. A unique feature of the area are the natural thermal baths, which can be an attraction all on their own or a much-needed source of relaxation after a long day on the slopes. 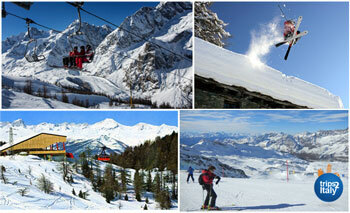 Another highly regarded skiing area in Lombardy is Madesimo. Located near the border of Switzerland, it offers approximately 30 miles of slopes for skiing, snowmobiles, and kite boarding, but is adjacent to such renowned winter sporting locales as Campodolcino, Motta, and Val Di Lei. Thanks to ideal weather and snowmaking capabilities, the season in Madesimo can run from November through late Spring. In addition, the nearby areas of Val Di Lei and Valchiavenna offer night skiing because of lighting systems placed on the slopes. Located in the South, just off the toe of Italy’s boot, and nearly surrounded by sea, Sicily may not be a destination that typically comes to mind for an Italian ski vacation. However, two ski areas in Sicily offer a one-of-a-kind experience – skiing on a volcano. Mt. Etna, the highest active volcano in Europe, features ski resorts Nicolosi and Piano Provenzana. While they offer a more limited number of slopes – a total of 12 miles of slopes between both – there is nothing quite like skiing on an active volcano while enjoying views of the crystal blue sea. In addition to skiing, Mt. Etna offers cross-country and freeriding, all available at a lower cost and with less crowds than resorts of the North. Surrounded by the picturesque Italian Alps, Piedmont features a variety of ski resorts that offer skiers the chance to enjoy multiple days without experiencing the same run twice. Perfect for beginners, experts, cross-country skiers, and snowboarders, the mountains of Piedmont – particularly in its capital, Turin – is ideal for winter sporting enthusiasts. Built in the 1930’s, the ski town of Sestriere is known as the ski capital of Italy. 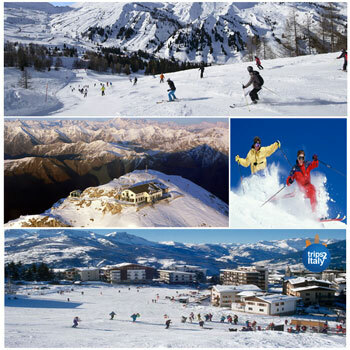 Having hosted the Winter Olympics in 2006, the Alpine World Championships in 1997, and the site of the annual Men's World Cup races, Sestriere offers fantastic snow and over 190 miles of slopes. Snowboarders are drawn to Sestriere because of its snowpark. 250 meters long, the snowpark features two lifts that will take snowboarders to the top in 5 minutes, as well as multiple sized jumps and a specific beginner-only area to allow novices and experts alike to enjoy their time without interruption. Another resort ideal for snowboarding in Piedmont is Bardonecchia, the snowboarding location for the Winter Olympics in 2006. 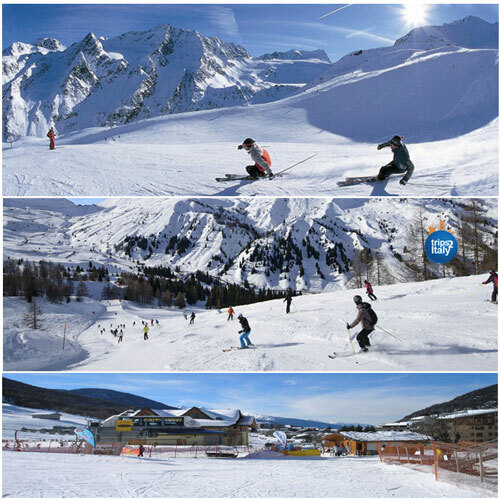 Rated in the top ten of Italy’s ski resorts, Bardonecchia features a snowpark surrounded by woods. It includes a 1500-meter drop, 1.5 kilometers of freestyle tracks, and over 60 jumps and jibs.